Final day of RPGaDAY 2018, and I hope you’ve found my posts useful and/or entertaining. I enjoy taking part in these every year, even if I haven’t quite mastered the “aDAY” portion of the event. Sometimes the questions posed are things I’ve never given much thought to, or they help me look at my hobby a different way. Sometimes they just let me reaffirm my love for TTRPGs, or pass along a game or an idea I think other people will love, too. Since I sort of treat Gen Con as Gaming New Year, it’s a great way for me to start my new year, sharing my love for this hobby. Starting next week we’ll be going to a “2+” posting schedule. I’ll post twice a week for sure, with additional posts as the spirit moves me. And of course if you can’t get enough of me here, head over to The Rat Hole. We’ll be taking a look at the Pathfinder Playtest over there, so you can get me first impressions on that when they go up. Over the years I think the main thing I learned about while playing myriad characters, was how to share. I know when I started playing I was all about the cool things that I could do, the sweet treasure I could get. I think that’s normal, especially if you start playing when you’re a child/adolescent. Eventually, hopefully, you learn that there is benefit to sharing the spotlight with other characters, letting them have their hero moment. That not trying to grab all the glory for yourself goes a long way to not only succeeding in the adventure, but making sure you get asked back to the gaming table. Not everyone learns this lesson right away (see also: Every TTRPG Troll on the Internet), and I think this is the basis of the majority of “I can’t find a gaming group!” complaints. Not all, of course, even with all the avenues to gaming I talked about in yesterday’s post it is still possible that circumstance makes finding a group difficult. But in a great many cases, by talking with the complainant for a few moments, I can figure out the likelihood that they did find a group, possibly several, but those groups decided to “unfind” that player. Sharing is also an important part of development as a game master. Learning to share helps move you from an Us v. Them attitude, to what the GM’s role should be: a collaborator who presents the players with challenges. If you stay stuck in an antagonistic role with your players, they will never really trust you as a storyteller, because you may just be lying to them for your own ends. If they know from the start that you are as invested in their success as they are, however, but you are going to challenge the crap out of them on the way to that success, your players are more likely to go along with what you present to them, even if at first glance it may seem against their interests. More so than as a player, the day that lesson really sank home for me was the day I really felt like a game master, like I was finally “good at” role-playing games. What’s this? Two daily RPGaDay posts in a row!? What crazy dreamworld is this!? Yes, but first you have to read through my shameless plug. It’s that time of year again, nerd folk, when I begin my run up to Extra Life. If you’re unfamiliar with Extra Life you can follow the handy link for more info, but in short it’s a day where I and many like me play games for 24 hours to raise money for sick kids. It’s a fantastic cause and I encourage you to join in or support it however you can. Of course one of those ways is to slide over to my snazzy donation page and make a donation. Every donation counts, no matter the size. As I’m fond of saying, if everyone who followed my on Twitter donated just $5, the price of a fancy coffee (mmm, fancy coffee), I’d rocket past my $1000 goal in not time. And then set a higher goal for myself, because I’m like that. But on with the main event! This is actually a tough question to answer because we live in the age of crowdfunding. Kickstarter, and other platforms to a lesser degree, have allowed us to get a lot of previously underrated or cult classic games back in print. Just a few years ago I might have answered this question with Villains & Vigilantes, for instance, but they have a new version out thanks to a successful Kickstarter campaign. I could answer just about any game from the Eighties and Nineties, and tomorrow find out the Kickstarter has begun. So maybe it’s time to make my wish come true. 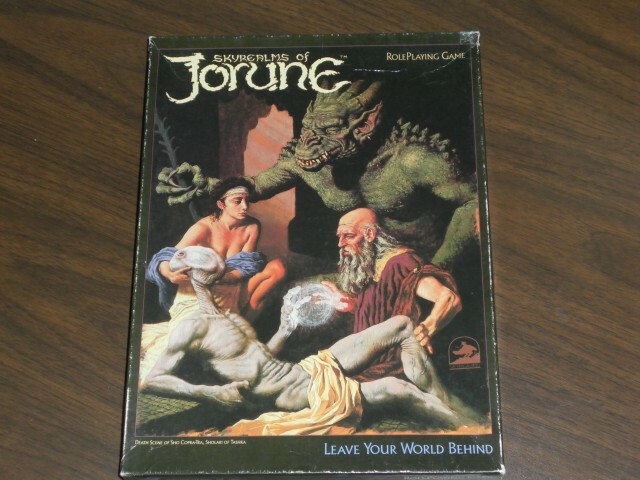 I would love an updated version of Sky Realms of Jorune. I feel like it was a game that didn’t really land when it first came out in 1984, partly because they immediately published a second version in 1985, which put some folks off. I discovered it on a family shopping trip to Edmonton, when I went to the little gaming/comic store that existed in West Edmonton Mall at the time. I was taken by the weirdness of the cover art, so I gambled some allowance money on it (and a D&D module, because I’m not crazy) and brought it home. I devoured the rulebooks on the drive back to Fort McMurray and new I wanted to run this game. Unfortunately, my friends weren’t as into it as I was. A game centered around trying to be come a good citizen just couldn’t compare to stomping through a dungeon, killing monsters and stealing treasure. So it languished on my shelf, often read and never played. I know there was a 1994 third edition, and I heard mixed reviews. But I would really love a brand spanking new version of the game. The game was already ahead of the curve thematically, I want to see that theme supported by new mechanics and everything we’ve learned in the 30+ years since it was first published. Not to mention new art…sorry, I seem to be salivating on my keyboard. What game would you like to see get its due? Answer in the comments. Look, we’re all adults here. You know I’m bad at sticking to these post-a-day schedules, I know I’m bad at it. Let’s not dwell. Let’s just enjoy the post. When I got into the hobby in 1980, I was living in the northern town (now city) of Fort McMurray. The only bits of gaming I could get ahold of in the first few years were the blue box Dungeons & Dragons set, the “pink box” Basic D&D box set with the Erol Otus cover, and the Dragon Magazines that the public library brought in as part of their periodicals collection. I loved that early art, especially the Erol Otus work. He had a “cartoony but dangerous” style (that’s how I described it to a friend at the time) that really appealed to me. But I also became a fan of much of the art that graced the cover and interior of Dragon Magazine. Cover artists back then would submit actual paintings, and you could tell from the quality of the work on display. Yes, there was the usual chain mail bikini art, but actually far less than people assume. Much of the art I saw in the magazine was much more interesting than that (though of course 12-year-old me also found the chainmail bikinis interesting, if impractical). I still find that art inspiring, and I often grab a shelf box of my old Dragon Magazines down and thumb through the pages when I’m looking for some adventure or character inspiration. I’ve used music on and off in the last several years at my gaming sessions. While I do feel it can be a great addition at the table, it wasn’t always practical for me as the only thing I had to play it on was an older laptop. Since I was also trying to read PDFs of my session material, I sometimes had issues. Currently, however, I’m taking a friend’s tablet for a spin in preparation of buying one for myself. I’ve found it extremely useful for music playback at the table, especially in combination with Spotify. If you search Spotify for D&D or Dungeons & Dragons, you can find any number of playlists to suit your game. And if you’re more into sci-fi or modern fantasy, you can still find plenty of great playlists to suit your needs, or even build your own. I was able to run a good playlist of music in the back ground of my last D&D game, and I found it helped everyone focus on the game a bit better, always a plus. I answered this one on Monday over at The Rat Hole, so I am shamelessly plugging the site. Besides my articles, Dave writes some great reviews that you should definitely check out. I love dice, so it’s very hard for me to give a single answer. In general, though, I love when the dice mechanics enhance some aspect of the game, instead of just being the thing you have to stop role-playing to do. 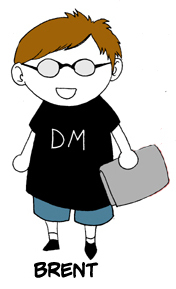 For instance, D&D 5e’s advantage/disadvantage mechanic is a simple enhancement that fits wonderfully with the existing base mechanic of the game. It allows a way for the DM to apply a reward or penalty to the situation without giving the player another bonus to track. On a different track, the mechanics in Star Trek Adventures enhance the feeling of playing a character on a Star Trek show. They allow the player to lean heavily on either their innate talent or their Starfleet training to get a task done, and the momentum reward system supports the dice mechanic in a fluid way. Definitely worth checking out, even if you aren’t a huge Star Trek fan. My favourite non-dice mechanic is still the playing cards from the original Deadlands RPG. The choice to use playing cards and poker chips in a weird west role-playing game was genius. And the fact that you used them not only for character creation but for running combat, with poker chips as in-game bonuses and experience points? Genius upon genius. I haven’t found another mechanic that so perfectly fit the game it supported than that one. It’s one of the reasons I will always play Deadlands if given the chance. That’s it for today. Will I post a regular post tomorrow? Only the Shadow knows…! If I had to pick a best compliment, it would be from Gen Con a few years back. I had a really good table of players, including a father and his son and daughter. As the game ended and I announced we were finished, the kids let out simultaneous disappointed groans. Then the father asked what table I was going to run at next, because he wanted to sign him and his kids up for that. And they did, and had just as much fun. That was a great feeling. I don’t really look for compliments when I run a game. But I do like noticing things like players leaning in during the tense moments at the table. Or those barely articulated gasps or exclamations that the game draws out of players. It’s a good feeling as a Game Master when you get confirmation that your game is having an effect on your players. You can’t force it, it comes or it doesn’t. But when it does, it validates everything about running games.